Great Danes make great dogs. They are loyal, intelligent, good with kids, playful, and protective. Even though they can reach up to 175 pounds, they are generally regarded as “gentle giants” to most who meet them. The term “pit bull” refers to a type of dog, but standardization of the American Pit Bull Terrier by the United Kennel Club is what has resulted in the Pit Bull most are familiar with today. Pit Bulls are tenacious, fiercely loyal, and highly intelligent, and not more aggressive than other breeds. Despite their media-driven misrepresentation, they are also very good with kids and extremely affectionate. Pit Bulls can weigh up to 85 pounds, but some variations of the breed top out at 30 pounds. With both breeds of dogs displaying highly desirable characteristics such as these, it’s no wonder that the Great Danebull, a Great Dane Pit Bull mix, has become a popular designer mix breed. The Great Dane and American Pit Bull Terrier both have long and interesting histories. Great Danes can be traced back to the 18th century, where large breeds of dogs were bred in Germany and England for wild boar hunts. In fact, Great Danes were originally known as “boar hounds” and eventually were named Germany’s national dog in 1876. Bred for their massive size, strength, and working traits, Great Danes today are descended from hard-working and intelligent hunting dogs. The American Pit Bull Terrier actually got its start in England. Pit Bulls were bred from English Bulldogs and Terriers. Their original intention was to bait bulls and bears for public entertainment. Once more stringent animal cruelty laws were instituted in England in 1835, the dogs were moved into rat pits to chase and kill rats for sport, leading to the “pit” being added to their breed name. While the dogs were bred to be courageous and strong, they were also bred to be loyal and gentle to their humans. As a result, they were called the “Nanny dogs” of England, named so because they were gentle and protective around children. While Great Danes are generally accepted to be very congenial in their nature, Pit Bulls have been given a bad reputation, especially in the media. 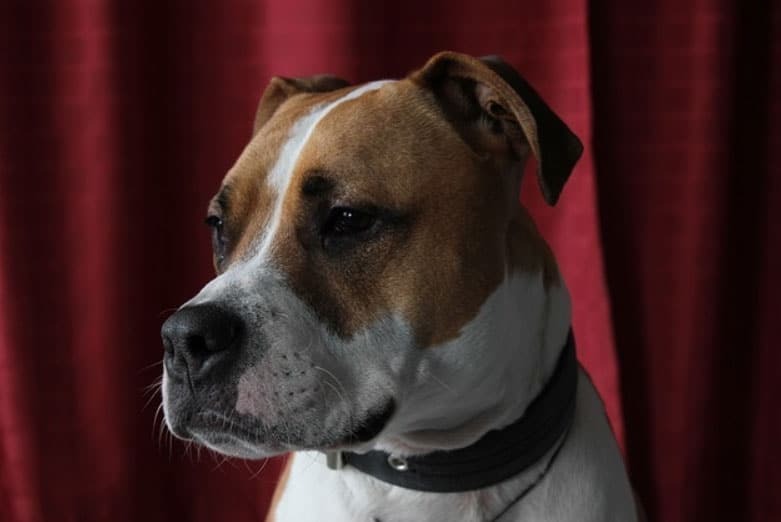 Lack of socialization, dog fighting environments, using the dogs for aggressive purposes, poor training, and poor ownership have led to highly publicized incidents of Pit Bull bites and attacks. The reality, however, is that Pit Bulls are less likely to bite without cause than more media-friendly breeds such as Collies and Golden Retrievers. Due to their baiting history, they were actually bred to be extremely gentle to people, as their handlers would need to get them out of the baiting ring quickly and did not want the dogs turning around on them a sad history, but a true one. Because of this trait being bred into many of the early Pit Bull lines, bully breeds who are well-socialized and responsibly owned are notoriously faithful and gentle to most humans and other dogs they meet. The Great Dane Pitbull mix can range in size from 24 to 30 inches high and weigh anywhere from 60 to 120 pounds. A lot of their size determination depends on the height and weight of the parents. Depending on the parents, the Great Danebull usually has long legs, a long skinny tail that curls upwards at the end, and a long, lean, and muscular body. The head of the Great Dane Pitbull mix can vary, from the longer, narrowed snout seen on Great Danes to the square, blockish head of the Pit Bull. 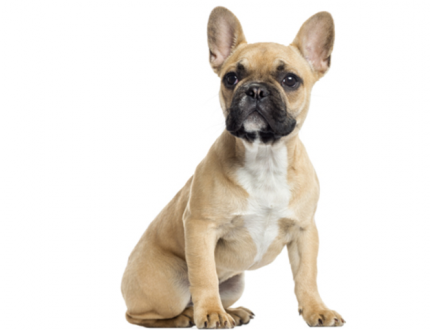 The ears may be long and floppy, like those on un-cropped Great Danes, or they may be shorter and sit lower on the head like those on un-cropped Pit Bulls. The coat of the Great Danebull is short, smooth, and shiny. It needs minimal grooming upkeep, and they shed a moderate amount. Their coats come in a variety of colors, according to their parents’ colors and patterns. Great Danebulls can be seen sporting black-and-white patterns, rich fawn or chocolate coats, sleek steel blue, and even brindle patterns. The possibilities for coat varieties are endless with this mix. The 2017 temperament scores of American Pit Bull Terriers and Great Danes are 87.4% and 81.5%, respectively. While both were bred to work and protect, they are both extremely loyal, courageous, intelligent, and intuitive. Both breeds are also quite playful. The Great Dane Pitbull mix has some great characteristics to pull from on both sides, and anyone who meets a Great Dane Pitbull mix will likely see these characteristics expressed. Great Danebulls will be good protectors of your home, but their barking levels will likely be lower due to the Great Dane traits. Great Dane Pitbull mix like to be challenged mentally and enjoy having a job due to their original breeding as working dogs. The terrier in them will likely want to chase small rodents and squirrels, so be mindful of this when you take them to the park or on a walk. With proper training and socialization, the Great Dane Pitbull mix will be amenable to meeting other dogs and enjoy playing in groups at the dog park or in doggie daycare. Great Danebulls need adequate training, but they are quick learners. While Great Dane Pitbull mix will have friendly temperaments, their size can be intimidating and their strength can be hard to handle. They need to be fully trained so that you will have confidence in maintaining control in any situation once they are full-grown. Great Danes grow very quickly, so they tire easily while young, even though they are extremely playful. Pit Bulls love to play tug-of-war, chase their favorite toys, and generally are quite active throughout their young lives. 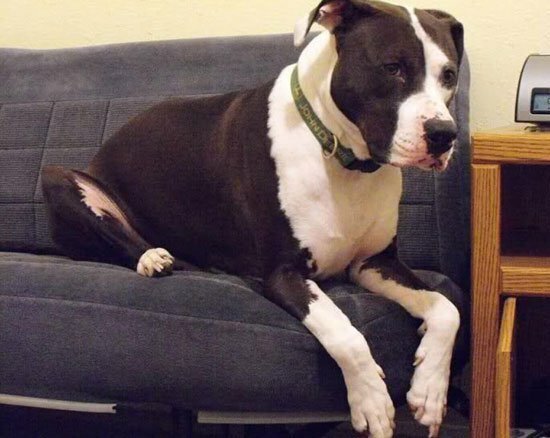 Both breeds, when found in a Great Dane pitbull mix, will likely need only moderate daily exercise, especially if they are on the larger side. A good 30 – 40 minute walk daily should be enough to get their cardio in, but having plenty of toys and tug-of-war ropes on-hand will also be important to a Great Danebull’s activity levels. 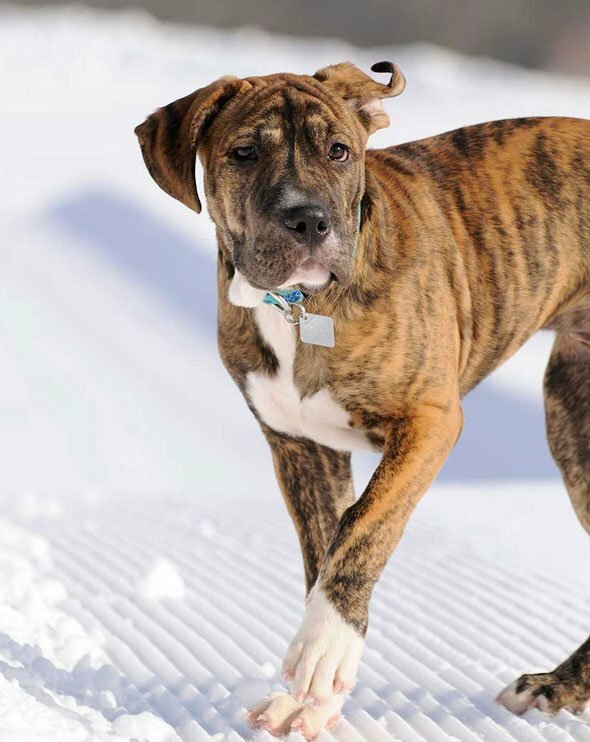 For Great Danebulls with higher energy levels, consider adding some weight to their walks to help boost their endurance while walking or jogging. This will also tire them out more quickly than a simple walk. 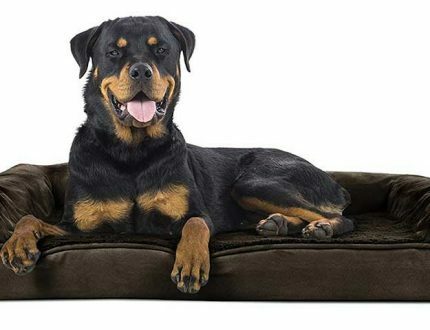 Both breeds have a moderate heat level tolerance, so exercising them in high humidity or heat is not ideal. Some of the bully breeds bred into “Pit Bulls” which are sometimes found in Great Danebulls also have shorter snouts, which can lead to breathing issues, especially if the heat index is high. As with any large breed, there are several health issues to watch. Unfortunately, there is a misconception that mixed breeds are less likely to carry some of the health issue traits found in purebred dogs. 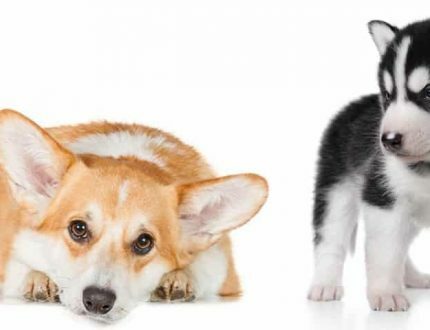 The reality is that dogs inherit traits from both parents, and if the parents have been irresponsibly bred, they may pass down health issues to their puppies. A common health issue in Great Danes include the very dangerous bloat, which is caused by a build-up of gases in the gastrointestinal system and can cause the stomach to flip. It is usually fatal. Large breeds are more susceptible to bloat than small breeds, so large Great Danebulls are at risk. Great Danes, because of their size, are also susceptible to heart issues such as dilated cardiomyopathy and tricuspid valve disease. In addition, Great Danes are more at risk for bone cancer. Pit Bulls often have skin dermatitis issues, which are treatable but usually a lifetime ailment. Pit Bulls are also susceptible to cataracts and some congenital heart defects. Both breeds are very susceptible to hip dysplasia, and this, along with bloat and cardiac problems, is one of the primary health issues found in Great Danebulls. Because Great Danebulls are not as large as Great Danes, their life expectancy runs a bit longer than their full-blooded giant counterparts. Great Danebulls have a typical life span of 10-14 years. The Great Dane Pitbull mix is not a recognized breed, and therefore breeding cannot be assured to be 50/50. Some Great Danebulls have more of one breed than the other in them, and there is no guarantee of purity in the breeding lines of Great Danebull breeders. 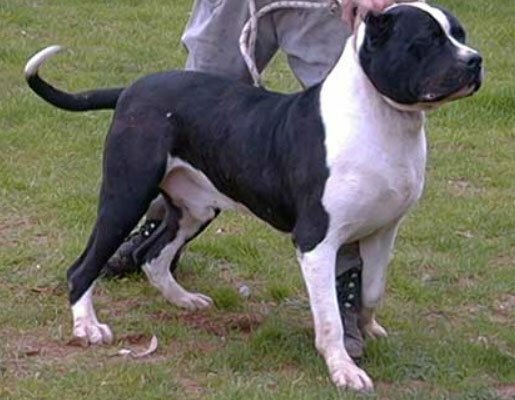 However, the Great Danebull has the potential to become a more popular and recognized breed, since the qualities of Great Danes and Pit Bulls are so desirable to many people. If you are considering a Great Dane Pit Bull mix such as a Great Danebull, you are choosing a breed with many desirable traits and qualities, and a very interesting historical lineage. 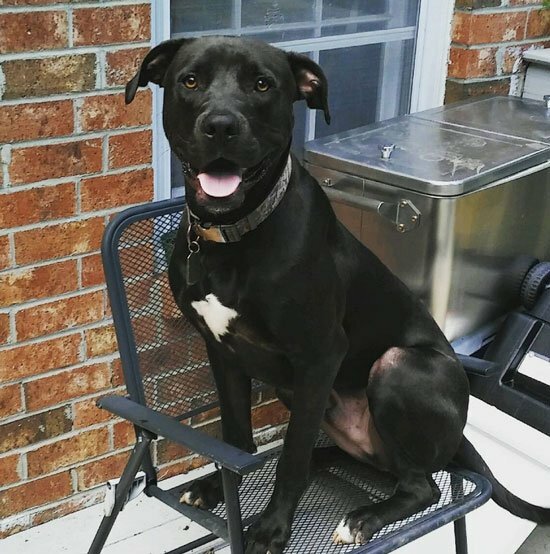 With good training, socialization, moderate exercise, and a loving home, you and your Great Dane Pitbull mix will live a long and healthy life together.